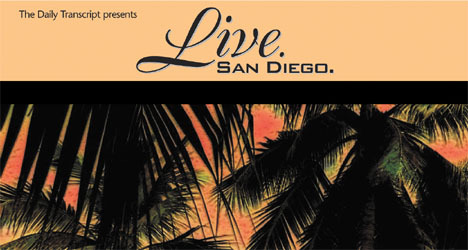 San Diego Source > Live. San Diego. Throughout the year, the Transcript takes an in-depth look at living in San Diego, from the local housing market and current developments to the newest lifestyle trends. San Elijo Hills' 7,600 residents are embracing the physical amenities and activities that grew out of the developer's desire to create a balanced community with the social attributes of a proverbial small town. Located in the heart of San Diego's Ballpark District, Icon, a new 327-unit urban community, is now complete. The project was one of the first to break ground under the East Village revitalization effort. San Elijo Hills, North County's award-winning, ocean view community located on the highest point of coastal North County, is welcoming its newest neighborhoods by California Cove Communities Inc. The new neighborhoods occupy some of the highest points in San Elijo Hills and offer panoramic vistas that can only be described as awe-inspiring. Surrounded by parks, trails and open spaces, the rural-inspired community of Venzano is a picture-perfect setting for home buyers looking for relaxed countryside living. Situated adjacent to the master-planned development of San Elijo Hills, families will enjoy the best of both worlds -- a close-knit community complemented by nearby urban amenities. The second quarter isn't even over yet, but sales have been very strong at Madeira at Del Sur by Shea Homes. The San Diego-based builder reports 13 net sales for the period starting April 1, making the single-family detached homes among the company's best-selling right now. San Diegans have a passion for golf, and why not? The climate is ideal year-round, the county enjoys the corporate presence of some of the major golf manufacturers in the world, and the courses themselves bring revenue into their communities. The public is invited to join residents of San Elijo Hills at "In the Park after Dark," a series of free family-friendly films shown outdoors on a 40-foot-wide screen in the town square, located at the intersection of San Elijo Road and Elfin Forest Road in San Marcos. The next film will be shown Saturday Aug. 25, beginning at dark, around 8 p.m. Guests are invited to come early and picnic in the square. Shea Homes San Diego has been ramping up production in South County, with three new neighborhoods opening this month and next. Ranging in price from the high $300,000s to the low $500,000s and offering attached and detached floor plans from 1,175 to 2,253 square feet, the three new neighborhoods complement five other Shea Homes neighborhoods now selling in master-planned communities in Chula Vista. Atrium at EastLake Vistas, one of the region's most distinctive new-home neighborhoods, recently earned "Best of the West" honors during the 44th annual Gold Nugget Awards program recognizing design/build excellence and innovation. Built by Del Mar-based Davidson, Plan 3 at Atrium was named best single-family detached home of 4,001 to 4,500 square feet during the annual PCBC-The Premier Building Show. Despite the recent cooling of the real estate market, luxury homeowners remain positive about the upper end of the market, according to the 2007 Coldwell Banker Previews International Luxury Survey. Brookfield Homes (NYSE: BHS) has just released a new phase of homes at Mahogany at Old Creek Ranch. The 12 homes in the new phase are priced from the $700,000s, and offer four to five bedrooms and 3.5 to four baths. For information about Mahogany, call sales representatives at (760) 752-3001 or visit the sales office at 1756 Burbury Way in San Marcos. Del Sur, the new master-planned community celebrating heritage, craftsmanship and the environment, has received another local award for outstanding accomplishments in environment-friendly building practices. Jinna Jeon, a realtor with Team Spirit Realty Investment, has found that her Korean-American clients like buying homes at Andalucia Townhomes in Carmel Valley, mostly because of property value and access to a top school district. Construction is under way at two new schools that will serve the newly opened master-planned community of Del Sur, where 2,500 homes are being built in the north end of the city of San Diego. Del Sur Elementary and Del Norte High School will emphasize high-tech, earth-friendly building and design practices and will be part of the acclaimed Poway Unified School District. As inventory levels remain high in terms of new and existing homes for sale, on a local and national level, recently released survey data suggests that buyers and sellers are beginning to see more eye to eye in regards to home pricing trends and accurate asking prices, which could indicate an increase overall sales activity. Ask Tom Sudberry what the main objective of real estate development should be, and he'll tell you something old-fashioned yet cutting-edge, traditional yet novel. In 1987, at the age of 18, John Stenberg was the youngest real estate agent in the Chula Vista home sales market. Throughout the year, the Transcript takes an in-depth look at living in San Diego. Each edition reviews topics impacting the local housing landscape, the newest lifestyle trends and developments around the county. Throughout the year, the Transcript takes an in-depth look at living in San Diego. Each edition reviews different topics impacting the local housing landscape, as well as the newest lifestyle trends. We also take a look at developments around the county. Throughout the year, the Transcript takes an in-depth look at living in San Diego. Each edition reviews different topics impacting the local housing landscape, as well as the newest lifestyle trends. We also take a look at developments around the county, as well as regionalized data on home sales and housing prices.